Are gemstone certificates worth anything? Keep in mind that these are my personal opinions and experiences. Other people may have different ones. The short answer is — sometimes. But often, NO. Gemstone certificates aren’t worth the paper they’re printed on. I can already hear the flak I’m going to catch because of this article. Can you rely on gemstone certificates to disclose whether stones have been treated or enhanced to improve their appearance or alter their colors? 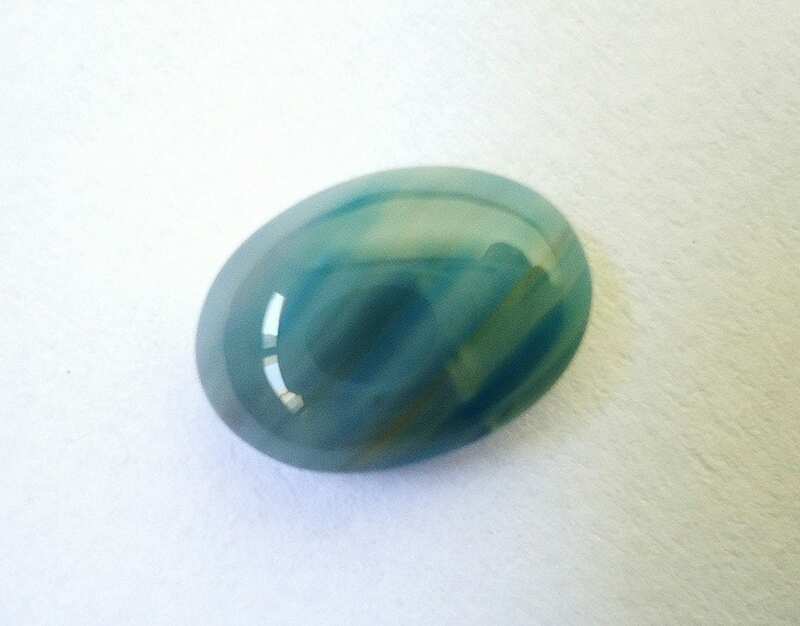 Artificially colored blue agate. Photo by Mauro Cateb. Licensed under CC By 2.0. OK, what do I mean? Well, quite a few things influence a gemstone certificate. The most important thing to remember is that a certificate is only as good, honest, and accurate as the person writing it. When you choose a gemologist to certify a gem for you, ask questions. Find out about their experience and reputation. Learn what gem grading system they use. This is critical for the quality of any certificate for a gem you may buy. Before buying an expensive gem, I recommend reading this article. What About Gemstone Certificates Written by Degreed Gemologists? Some certificates are done by gemologists with degrees from somewhere like the Gemological Institute of America (GIA) or another accredited school, and there are many schools. In theory, a certificate written by a GIA gemologist or a graduate of some other well-known gemology school should be reasonably acceptable. Just don’t depend on it. The GIA and other similar institutes — and the vendors selling stones with certificates from people trained by these schools — have a sales pitch. That is, their gemstone certificates are all quality and consistent. These people promote the “party line,” so to speak: their certificates are not only the industry standard but also honest and trustworthy. In reality, some of these certificates are good, some are not. Some gemologists who write these certificates just barely pass their tests at these schools. They may also lack real life experience. Furthermore, frankly, some have absolutely no business ethics or common sense. Of course, you also have a few gemologists who graduated tops in their classes and have good ethics. So, at best, certificates written by degreed gemologists are a mixed bag. They vary as widely as the people writing them. When you start talking about gemstones and business ethics, you must realize some people in the gem business do the bare minimum while others go the extra mile for their customers. Some gemologists as well as sellers strive to disclose all available information about a gem. They’ll actually look into and check questionable stones. Some won’t. What do I mean? Take the andesine gemstone scams. Very, very few gemologists or gem dealers investigated undisclosed treatment issues, even though many people (like me) had raised serious doubts and questions about these stones. This was years before the scandals actually broke and became public. Basically, the “party line” of the big institutes was that everything was fine. They never uttered a word of caution or information. Yes, it makes me mad. At best, these institutes failed to protect honest people through incompetence and politics. At worst, they were involved with the scams. Meanwhile, despite their claims of innocence, the commercial interests are at least guilty of not bothering to verify their stones or asking suppliers the right questions. And yes, these sellers certainly know better, and so do the commercial interests selling the bad stones. Ethically deficient commercial interests, as well as individual gem dealers, made millions selling the treated stones. In my opinion, the people who bought them were cheated, basically. Many, if not most, of these andesines were treated. Their color wasn’t natural. Thus, they don’t have the rarity or value that commercial sellers claimed. Although a few (and I do mean a few) gemologists and dealers raised the alarm and questioned the andesine, the vast majority didn’t. Most in the trade all played “don’t ask any questions and don’t tell lies.” They went along with it because they were all making money. They didn’t want to know what may have happened with the treatments in Bangkok as well as other places. On a related note, I think the same scam is happening with the copper treatment of tourmaline to create paraíba-like color. A lot of questionable things are happening. I have personally seen tourmaline treated with copper to make it blue. A few gemologists are warning of problems. However, the big commercial sellers and the gem institutes remain quiet. In my opinion, they’re doing basically nothing, as usual. I also want to point out that when I and a few others I know have asked questions and spoken up about problems in the trade with andesine and other stones, we were — and are — often attacked viciously by the dishonest people selling the undisclosed treated stones. The attacks get personal and plain nasty. What Kind of Gemologist do You Want to do Business With? So, ask yourself this: what kind of person do you want to do business with? Or, do you want someone with poor ethics who uses the excuse that the “Official Institutes” haven’t uttered a warning? Someone who follows the “party line” and never informs you of issues that might have relevance to buyers? Right. You want the person with a high standard of ethics who’ll say, “I think there may be a problem.” Sadly, you can find very few around. By the way, the majority of graduate gemologists I know fall into the “party line” category. So as you may guess, I have little regard for them. In gemology, like any other field, you’ll find a few experts and many trade types with a fair amount of experience. You’ll also find those who shouldn’t be in the field. They shouldn’t go anywhere near a gemstone. So be careful how you choose a gemologist. I’ve seen dishonest (or at least, “judgement impaired”) people write gemstone certificates more than once. Of course, mistakes in grading happen all the time. Some are honest mistakes; some are not. I’ve seen very questionable grades on some certificates. I don’t know if the gemologists responsible just lacked experience or if they twisted the results in the direction they wanted. Here’s a true story. I have a friend (many actually — and yes, sometimes we agree to disagree on grading issues) who is a graduate gemologist. He got a job doing in-house gemstone certificates for a large retail commercial jewelry company. The salespeople used these certificates to promote their merchandise. A week or two later, he reviewed some of his certificates and found the grades changed. They were higher, in many cases several grades higher, than what he originally gave the stones. He corrected them and went to his boss to point out the problem. The boss told him another gemologist had looked at his certificates and graded the stones higher. (My friend knew this was a lie; he was the only gemologist at that branch at the time). The boss then lectured him about needing to change his standards. If a gemstone was on the border between grades, he should grade the stone up in value, not down. My friend quit the job. Remember, this was a major jewelry marketer. This type of thing happens all the time. Many people just go along with it. So, no, you can’t generally trust a gemstone certificate, in my opinion, especially from most of the larger commercial jewelry and stone sellers. Although you may find some honest ones, in my experience, frankly, they’re in the minority. On some stones, just one grade difference can mean thousands of dollars difference in profits. Personally, when in doubt, I grade a stone “down.” However, many commercial sellers bend the grades “up” as far as they can to increase profits. My friend’s story brings me to another factor that contributes to the quality of a gem certificate, in addition to the ethics and experience of the person writing the certificate. The system used to grade the stone also plays an important role. I have some serious disagreements with the colored gemstone grading system the GIA uses. In my opinion, the system is slanted to give the best interpretation to many of the “commercial” cut types of gems and the people hustling them. The GIA and other schools need commercial cutters and trade houses to stay in business. These commercial interests also hire the schools’ graduates. So, there’s a lot of buried self-interest involved. Money flows from these trade groups and commercial interests and often finds its way into the schools as “gifts” or “contributions.” This is well documented. Just do a little research and you’ll find many articles on scandals in many gemological institutions. You’ll also find out about diamond overgrading. Still doubt gemology scandals are widespread? Here’s a link to an article on the GIA’s own diamond scandal on Rapaport News, one of the diamond trade’s main news organizations. (You can learn about the settlement and its effects here). In my opinion, there were/are some very questionable politics and associations involved with the GIA grading system. I find the system bad enough that I won’t use it. There are many gem grading systems, but no international standard gem grading system exists. I use my own common sense grading system. I think it’s the easiest and most honest. But keep in mind, since so many systems exist, you need to know what system the grader used to write a gem certificate. Furthermore, you need to understand how the system works. For example, I’ve seen some sellers using a system with clarity grades that favored the seller and could mislead consumers. OK, by now you get my point. I’m not impressed by the GIA in particular and institutions in general that offer gemstone certificates or train gemologists to write certificates. Having made that clear, I would still say that having a gem certificate from an accredited gemologist is better than nothing. They do have standards, even if they’re low ones, in my opinion. In a few cases, you may get an accurate certificate by a good gemologist. Just don’t count on it. Some of the best and most honest gemstone certificates I’ve seen were written by quality faceters (like me). These are people who actually cut gemstones. Some of the worst and most dishonest certificates were from large dealers trying to hustle a dollar. What you should seek before buying an expensive stone is a gem certificate from someone independent of the seller. This will likely be more accurate, at least as far as the basics. Beware of in-house gem certificates. I would advise anyone buying expensive gemstones to do their homework. Make sure you know what gem grading system the certificate writer is using. You should at least know the basics. This will give you a better idea of the quality of the stone in question. Also, learn about the business reputations of the people involved, the certificate writer as well as the dealer. Gemstone certificates can serve as guides. However, education is the best way to be sure you get what you pay for. So educate yourself.